The Seventy-Two resolutions were produced originally from the Quebec Conference (of 1864), approved by the colonies of Eastern British North America and was later revised in the London Conference (of 1866). It received mixed reactions throughout the colonies and essentially led the way for the Confederation of Canada. 5. The Sovereign or Representative of the Sovereign shall be Commander- in-Chief of the Land and Naval Militia Forces. 20. For the purpose of such re-adjustments, Lower Canada shall always be assigned sixty-five members, and each of the other sections shall at each re- adjustment receive, for the ten years then next succeeding, the number of Members to which it will be entitled on the same ratio of representation to population as Lower Canada will enjoy according to the Census last taken by having sixty-five Members. 1. The Public Debt and Property. 2. The Regulation of Trade and Commerce. 3. The imposition or regulation of Duties of Customs on Imports and Exports, -- except on Exports of Timber, Logs, Masts, Spars, Deals and Sawn Lumber from New Brunswick, and of Coal and other minerals from Nova Scotia. 4. The imposition or regulation of Excise Duties. 5. The raising of money by all or any other modes or systems of Taxation. 6. The borrowing of money on the Public Credit. 7. Postal Service. 8. Lines of Steam or other Ships, Railways, Canals and other works, connecting any two or more of the Provinces together or extending beyond the limits of any Province. 9. Lines of Steamships between the Federated Provinces and other Countries. 10. Telegraphic Communication and the Incorporation of Telegraph Companies. 11. All such works as shall, although lying wholly within any Province be specially declared by the Acts authorizing them to be for the general advantage. 12. The Census. 13. Militia -- Military and Naval Service and Defence. 14. Beacons, Buoys and Light Houses. 15. Navigation and shipping. 16. Quarantine. 17. Sea Coast and Inland Fisheries. 18. Ferries between any Province and a Foreign country, or between any two Provinces. 19. Currency and Coinage. 20. Banking -- Incorporation of Banks, and the Issue of paper money. 21. Savings Banks. 22. Weights and Measures. 23. Bills of Exchange and Promissory Notes. 24. Interest. 25. Legal Tender. 26. Bankruptcy and Insolvency. 27. Patents of Invention and Discovery. 28. Copy Rights. 29. Indians and Lands reserved for the Indians. 30. Naturalization and Aliens. 31. Marriage and Divorce. 32. The Criminal Law, excepting the Constitution of Courts of Criminal Jurisdiction, but including the procedure in Criminal matters. 33. 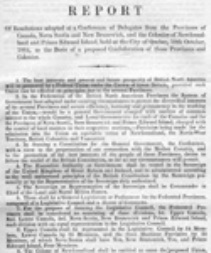 Rendering uniform all or any of the laws relative to property and civil rights in Upper Canada, Nova Scotia, New Brunswick, Newfoundland and Prince Edward Island, and rendering uniform the procedure of all or any of the Courts in these Provinces; but any Statute for this purpose shall have no force or authority in any Province until sanctioned by the Legislature thereof. 34. The Establishment of a General Court of Appeal for the Federated Provinces. 35. Immigration. 36. Agriculture. 37. And generally respecting all matters of a general character, not specially and exclusively reserved for the Local Governments and Legislatures. 42. The Local Legislature shall have power to alter or amend their constitution from time to time. 1. Direct taxation, and in New Brunswick the imposition of duties on the Export of Timber, Logs, Masts, Spars, Deals and Sawn Lumber; and in Nova Scotia, of Coal and other minerals. 2. Borrowing money on the credit of the Province. 3. The establishment and tenure of local offices, and the appointment and payment of local officers. 4. Agriculture. 5. Immigration. 6. Education; saving the rights and privileges which the Protestant or Catholic minority in both Canadas may possess as to their Denominational Schools, at the time when the Union goes into operation. 7. The sale and management of Public Lands excepting Lands belonging to the General Government. 8. Sea Coast and Inland Fisheries. 9. The establishment, maintenance and management of Penitentiaries, and of Public and Reformatory Prisons. 10. The establishment, maintenance and management of Hospitals, Asylums, Charities, and Eleemosynary Institutions. 11. Municipal Institutions. 12. Shop, Saloon, Tavern, Auctioner and other Licences. 13. Local Works. 14. The Incorporation of Private or Local Companies, except such as relate to matters assigned to the General Parliament. 15. Property and civil rights, excepting those portions thereof assigned to the General Parliament. 16. Inflicting punishment by fine, penalties, imprisonment or otherwise, for the breach of laws passed in relation to any subject within their jurisdiction. 17. The Administration of Justice, including the Constitution, maintenance and organization of the Courts, -- both of Civil and Criminal Jurisdiction, and including also the Procedure in Civil matters. 18. And generally all matters of a private or local nature, not assigned to the General Parliament. 49. The House of Commons or House of Assembly shall not originate or pass any Vote, Resolution, Address or Bill for the appropriation of any part of the Public Revenue, or of any Tax or Impost to any purpose, not first recommended by Message of the Governor General or the Lieutenant Governor, as the case may be, during the Session in which such Vote, Resolution, Address or Bill is passed. 55. The following Public Works and Property of each Province shall belong to the General Government, to wit: -- 1. Canals. 2. Public Harbours. 3. Light Houses and Piers. 4. Steamboats, Dredges and Public Vessels. 5. River and Lake Improvements. 6. Railways and Railway Stocks, Mortgages and other debts due by Railway Companies. 7. Military Roads. 8. Custom Houses, Post Offices and other Public Buildings, except such as may be set aside by the General Government for the use of the Local Legislatures and Governments. 9. Property transferred by the Imperial Government and known as Ordnance Property. 10. Armories, Drill Sheds, Military Clothing and Munitions or War; and 11. Lands set apart for public purposes. 63. Newfoundland and Prince Edward Island, not having incurred Debts equal to those of the other Provinces, shall be entitled to receive, by half- yearly payments, in advance, from the General Government, the Interest at five per cent on the difference between the actual amount of their respective Debts at the time of the Union, and the average amount of indebtedness per head of the Population of Canada, Nova Scotia and New Brunswick. 64. In consideration of the transfer to the General Parliament of the powers of Taxation, an annual grant in aid of each Province shall be made, equal to eight cents per head of the Population, as established by the Census of 1861; the population of Newfoundland being estimated at 130,000. Such aid shall be in full settlement of all future demands upon the General Government for local purposes, and shall be paid half-yearly in advance to each Province.